This week saw the last two visits to the artists who will be exhibiting at the Lexden Arts Festival this year. On Monday I had a trip up to Martlesham Heath, north of Ipswich, to see Caroline Sullivan. Caroline designs and makes her own knitwear range, using luxury yarns sourced in Scotland. I love her sense of colour – she is so clever at putting together complex patterns that are really attractive, and all her garments are beautifully finished off – for example, she was wearing one of her own waistcoats, as you can see in the photo below, and even the button band had a really intricate pattern running down it! Caroline showed me the room on the side of her house where she has her studio – with tall shelves full of colourful spools of yarn, and her knitting machine, surrounded by sketchbooks and samples. She explained that she uses a very basic knitting machine, as it allows one to be much more creative. Caroline will be showing jackets and waistcoats, neck warmers (circular scarves), fingerless gloves and a range of hat styles, and I know the ladies of Lexden – and further afield! – are going to love them! 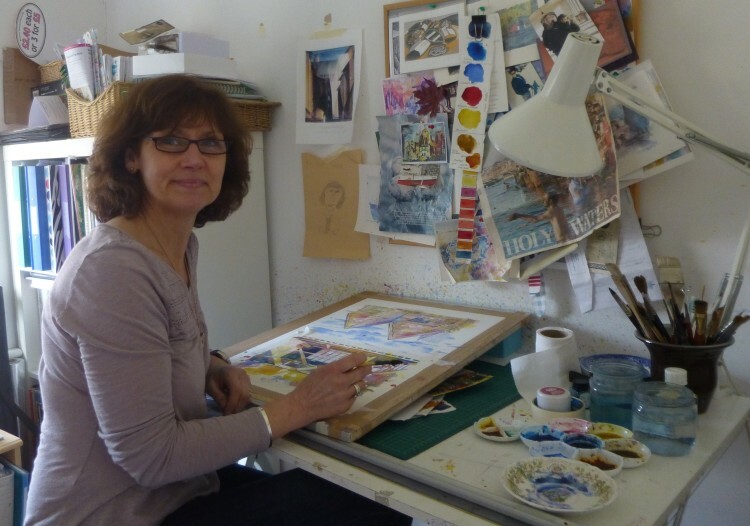 Caroline’s website is being updated at present, but information about her can be found on the Suffolk Craft Society’s website.